A group of 22 brand-new college students gathers each week for an intimate, three-hour seminar. They might be delving into string theory, modern Islam, or hip-hop. A peer mentor offers them extra support outside class. An adviser helps them map out their college career. 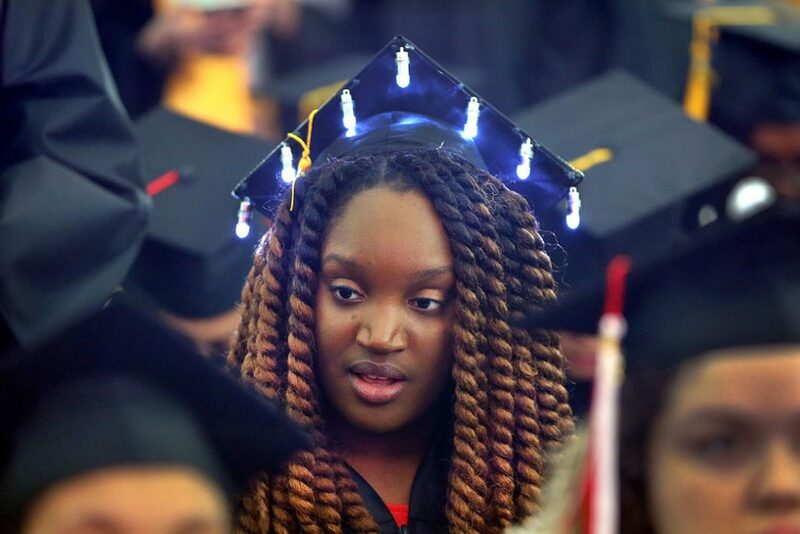 As the Center for American Progress found in its 2017 report “Hidden in Plain Sight: Understanding Part-Time College Students in America,” it’s relatively difficult to find other types of innovations aimed squarely at part-time students.7 But there’s a profound need for answers. That’s why new data from Bunker Hill’s Office of Institutional Effectiveness is exciting. It is presented here for the first time. 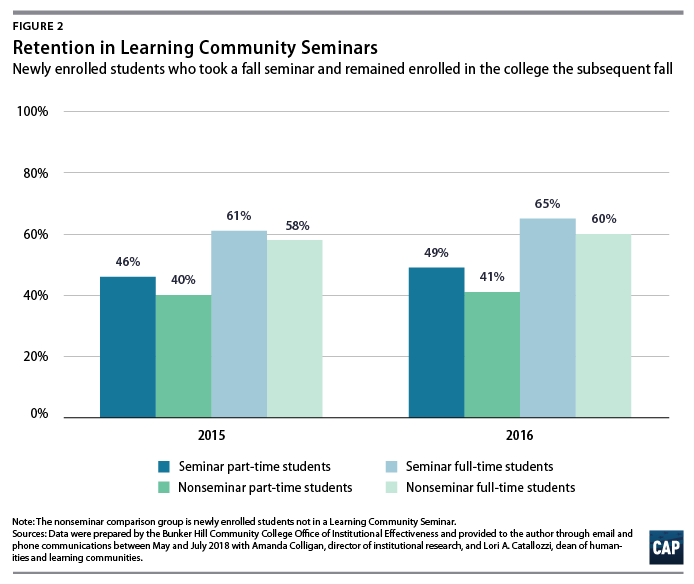 Part-time students who enroll in any of Bunker Hill’s several types of learning communities in their first year are 7 percent more likely than are other part-time students to remain enrolled in the college a year later, and full-time students in learning communities are 6 percent more likely than are other full-time students to remain enrolled a year later. These findings come from a regression analysis by Bunker Hill’s Director of Institutional Research Amanda Colligan. The analysis controls for demographic and economic differences among students who have taken the classes and those who have not. Colligan said she and her colleagues do not worry that the data could be skewed by students with stronger academic preparation taking learning communities in higher numbers, as many learning communities include courses with remedial elements that serve students with developmental needs. There’s also preliminary evidence indicating that learning communities may have a greater effect for students of color than they do for white students. Students of color at Bunker Hill are more likely than are white students to study part time, and one of the goals of the learning communities project is to help the college achieve more equitable outcomes for students of all races and ethnicities. The college is still breaking down its data for demographic factors such as race, gender, and age. However, Colligan found in another analysis that for students of color, there is a statistically significant association between enrolling in any of the college’s learning communities in their first term and remaining enrolled for the next two semesters. The same association did not show up for white students. While Bunker Hill’s learning communities model is still evolving, and research on its impact is ongoing, it provides a powerful case study of the potential for a community college to help part-time students succeed on campus. This issue brief details the evolution of learning communities at Bunker Hill and considers the successes and shortcomings of each of the three different types: seminars, clusters, and professional studies seminars. The brief then explores the theory behind using learning communities to improve outcomes for part-time students and outlines the work that still needs to be done. Still, Bunker Hill has been recognized in recent years for making gains in student outcomes through systemic reform.11 The learning communities project is at the center of those reforms. Bunker Hill’s work on learning communities builds on a model that has been used at U.S. two- and four-year colleges for years.12 There isn’t a single, national definition of “learning community,” but the idea is that students work closely with a small group of classmates and engage “with ‘big questions’ that matter beyond the classroom.”13 Usually, it involves a group of students together taking two classes that have connected content—although some of Bunker Hill’s learning communities involve only one class. Bunker Hill offers three types of learning communities, all aimed at full- and part-time students in their first year at the school. All the courses are designed to build community and engage students with discussion, projects, group work, and off-campus trips. Learning Community Seminars feature an interdisciplinary seminar with support woven into the class from two staff members—a peer mentor who is a fellow Bunker Hill student and a coach from the college advising staff—who work alongside the instructor. Learning Community Clusters entail one group of students taking two classes together in the same semester. Professors of these classes coordinate with each other to connect their material around common themes. Although clusters originally did not include peer mentors or success coaches, those elements have recently been introduced into some clusters. Professional Studies Learning Community Seminars are available for students majoring in preprofessional fields such as nursing, business, or information technology. Students who have declared a major in these fields are required to take a seminar that offers an introduction to their particular major. As with the regular seminars, a success coach and a peer mentor work alongside the instructor. Bunker Hill has only gradually expanded its learning community requirement to part-time students. That’s because data on the impact of learning communities specifically on part-time students only recently became available, and also because expanding the program to thousands more students all at once is logistically difficult. Today, all professional studies students, no matter their credit load, and students in other majors taking nine credits or more are required to take a learning community course in their first year. At Bunker Hill, taking 12 credits a semester means that a student is considered full-time, while a 15-credit course load keeps students on track to earn an associate degree in two years. In light of the new data, reported in this brief, the college is considering expanding the requirement to students taking fewer than nine credits, as well as to those in certificate programs. A trained student mentor sits in on every class, holds office hours, and helps students find the resources they need, whether it’s tutoring or help with an off-campus housing crisis. The success coach—a member of the college advising staff—works with the professor and directly with students on mapping their education plans and building career skills. Newly enrolled part-time students who took a seminar in fall 2015 and those who took one in fall 2017 were 15 percentage points more likely to persist into the following spring semester than were those who did not. Those who took a seminar in the middle year—fall 2016—saw a much smaller bump of 3 percentage points. Officials said they don’t know why that year’s results are so much less dramatic. All these percentages represent raw counts of students and have not been adjusted for any demographic differences. Lloyd Sheldon Johnson, one of the professors who teaches this cluster, said students read slave narratives in their writing course before he puts the traumas that slaves experienced in the context of psychopathology and the theories of classic thinkers such as Sigmund Freud and Erik Erikson. He believes that the intellectual engagement and the chance to get to know classmates more deeply are the reasons he sees his cluster students doing better academically than do those he teaches in a regular psychology class. Newly enrolled students in these classes saw gains over students who enrolled in at least one of the same courses in a stand-alone format, but the gains were smaller than those experienced by students in the seminars. That might be because the cluster model did not originally include peer mentoring or success coaching. However, enrollment has grown in clusters and shrunk in seminars, partially because so many students place into developmental courses. So Bunker Hill is now experimenting with peer mentoring, tutoring, and success coaching in cluster courses. Part-time students who enrolled in the cluster courses were also more likely to re-enroll a year later than were part-time students in the comparison group, while full-time students enrolled in the clusters had mixed retention outcomes compared with the comparison group. 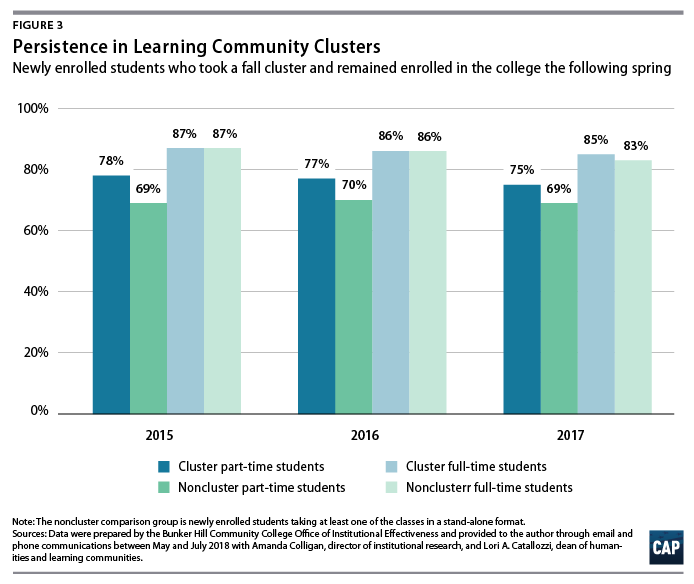 (see Figure 4) Officials theorize that the clusters are not as likely to make a difference for full-time students, because they are more likely to receive support in other venues on campus. 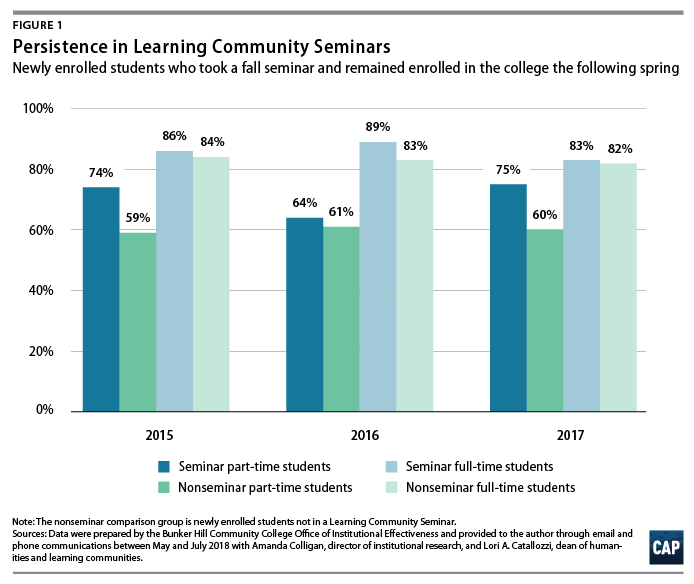 The data on persistence and retention for both part-time and full-time students in these classes is far more mixed than it is for the other seminars or the clusters. For example, among newly enrolled part-time students who had declared a professional studies major, those who took these specialized seminars in fall 2015 and fall 2016 had higher persistence into the spring than did those who did not fulfill their seminar requirement in their first term at Bunker Hill. But those who took the seminars in fall 2017 did not. The picture was also mixed for full-time students. Lori A. Catallozzi, Bunker Hill’s dean of humanities and learning communities, said that the seminars were generally retrofitted from lecture courses and that some of the courses have yet to find their groove in an active-learning seminar format. Learning communities appear to be particularly successful for Bunker Hill’s part-time students due to three factors: the relationships with other students; the connections in some classes to supportive resources such as mentoring and coaching; and a more meaningful, satisfying academic experience than first-year students are likely to experience by taking only a couple classes at a time. On the relationship front, because part-time students spend less time on campus, they are less likely than are full-time students to form friendships, get to know professors, or visit an advising center.25 Such relationships often help tether students to campus when problems in their daily life threaten to unmoor them.26 The learning community courses are designed to offer those relationships. On the academic front, students entering a community college often start in classes that focus on teaching them foundational college skills, particularly if they have remedial coursework to complete, rather than delving into a chosen field of knowledge. But that isn’t always the most fulfilling learning experience, Catallozzi said. Because part-time students are taking fewer classes at a time, they are moving more slowly through college and have to wait longer to get to upper-level classes that are typically more engaging. While Bunker Hill leaders feel very encouraged about the potential their learning communities have to better support part-time students, they know they have more work to do. The gains in persistence into the spring semester are significantly higher than is the boost in retention for the following fall. To address this issue, officials say they are working on ways to formally extend the relationships built in the learning communities into later semesters, for both full-time and part-time students. This includes professors encouraging students to register together in groups for a specific class the following term, so that they can maintain the sense of community they’ve built. Another goal is to make sure that students keep working with the same success coach. Officials are also looking at ways for instructors teaching nonlearning community classes to weave in more opportunities for students to plan their educational and career paths. Bunker Hill leaders acknowledge that they have not yet seen the gains in retention translate into increased graduation rates. The college has not seen a bump in overall completions tied to the learning community project. Vallie has advocated for finding ways to offer students who are further along in their time at Bunker Hill the same types of supports that have made the learning community model successful. The behavioral sciences department, for example, is working on a system to require students who reach the halfway mark on the path to their associate degree to connect with an adviser to go over their educational and career plan. College leaders also intend to undertake more qualitative research to get a better understanding of what part-time students find most helpful in the learning communities. Bunker Hill has not formally calculated the costs involved in learning communities. But after grants helped the college develop the project, the classes are relatively inexpensive to offer. Costs include paying faculty $300 once a year for training and, on a one-time basis, $525 to design a new learning community course. Peer mentors earn between $11 and $12 an hour and spend about six hours a week mentoring the students in each seminar, typically for 15 weeks. There are currently 12 success coaches, but working with the learning communities is only part of their job. The learning communities program also has three dedicated administrators. It is important to watch whether the gains Bunker Hill has seen for part-time students will translate into higher completion rates. Still, the project’s results so far should be enough to inspire other community colleges and four-year institutions to think about the potential of learning communities—or elements of them, such as peer mentoring and success coaching—to help improve the odds part-time students face. Bunker Hill is also an important example of a college where leaders have made it a priority to delve into the specific results of part-time students, a group that is too often ignored or lumped in with full-time students, even though they are a majority at most community colleges. If every college with a large population of part-time students gives equal focus to the issue, more solutions will become evident. Marcella Bombardieri is a senior policy analyst of Postsecondary Education Policy at the Center for American Progress.